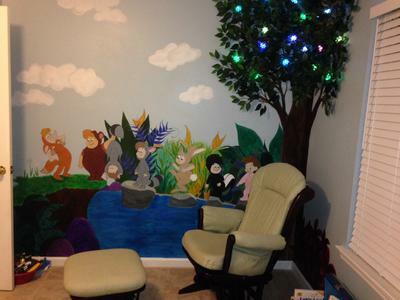 I sketched out the design for the walls of my baby's Peter Pan Neverland theme nursery and painted it with acrylic craft paints. I added artificial leaf branches and garland that I bought from the craft store to give the tree a 3D look. 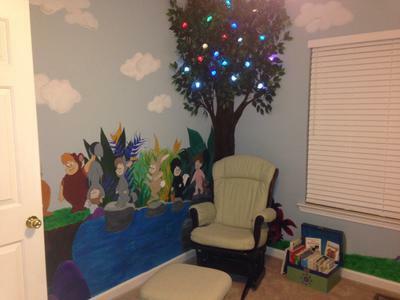 Then I found some battery powered LED lights that change color to light the wall's tree. I bought the stars and painted them in metallic silver and had family members that attended the baby shower decorate and write words of love on the stars that are hung above the baby's crib. 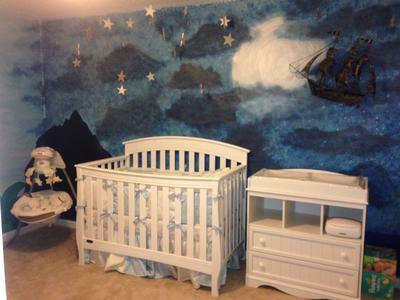 There is a 3D metal pirate ship located over the moon for Captain Hook's ship that is in keeping with the Peter Pan Neverland theme nursery as well as a friendly crocodile included in the nursery wall mural. 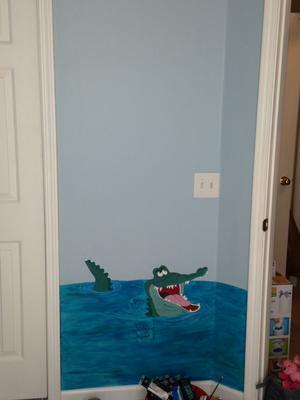 I hope that visitors to Unique Baby Gear Ideas like the storybook decor! I can't wait to share it with our little one.